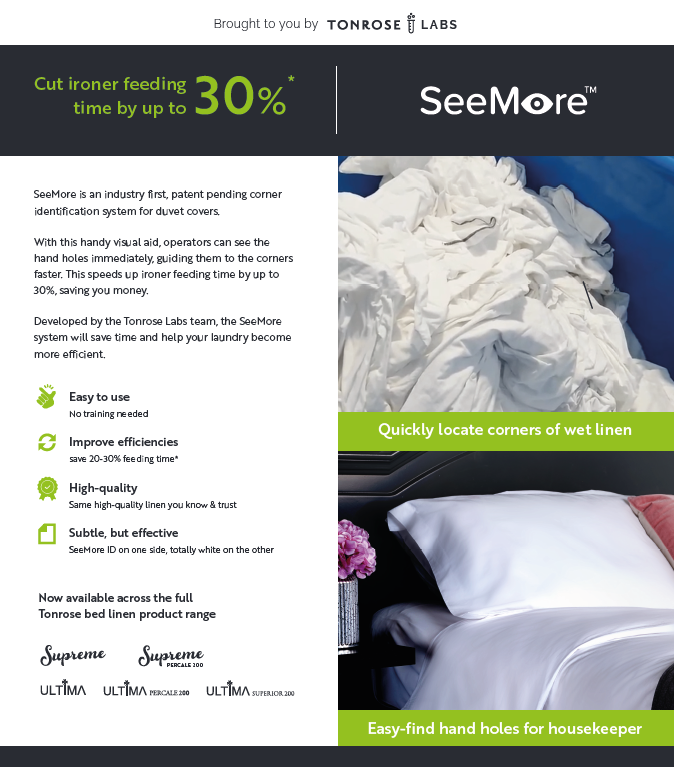 Tonrose is delighted to announce the arrival of its newest efficiency innovation, SeeMore. SeeMore is an industry first, patent pending corner identification system for duvet covers. With this handy visual aid, operators can see the hand holes immediately, guiding them to the corners faster and speeding up ironer feeding time by up to 30%*. Developed by the Tonrose Labs team, the SeeMore system will improve productivity and PPOH (pieces per operator hour). Get in touch today to see how Tonrose can help your laundry to become even more efficient. Interested? We’d love to tell you more! * 20-30% time saving demonstrated under test conditions. Results may vary.